In April last year I had a call from my children's dance teacher's mother, Mrs L. One of Mrs L's nearly lifelong friends had passed away recently. 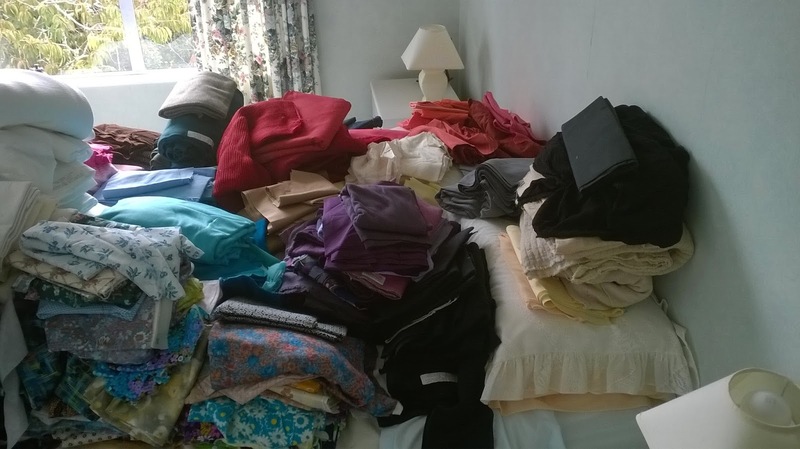 When clearing out her home her daughter's had not known what to do with the stash of fabric. 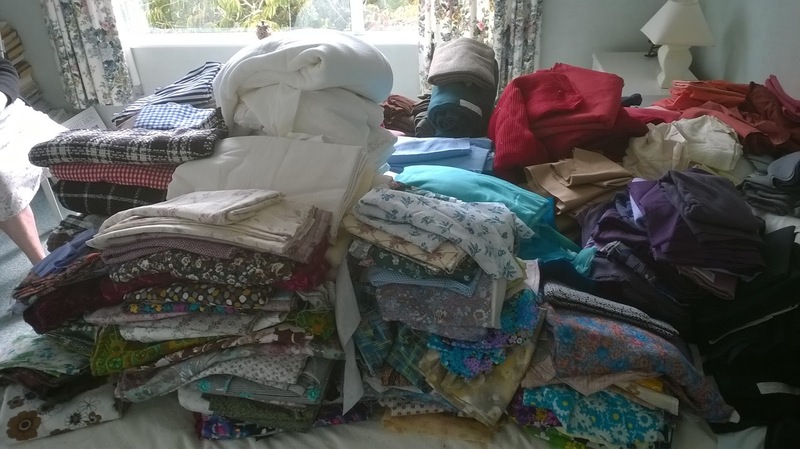 They knew that Mrs L used to do a lot of sewing so asked her if she would be able to sort it out for them. Mrs L called me to ask if I would like to take a look and to take what I wanted! 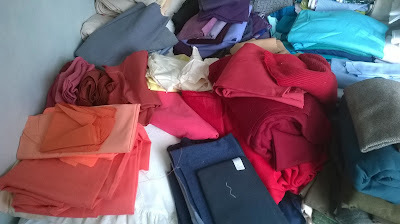 Did I say, "Oh, no thanks, I have enough fabric already . . . " Nope! I was over there pretty quickly! When she said a lot Mrs L really did mean A LOT! And piles . . .
All colours of the rainbow, and Mrs L had sorted them all! Still more . . . so much that it was a visual feast! Plains, plaids, patterns, paisleys . . .
Mrs L was a bit despairing of just how she was going to dispose of it all. 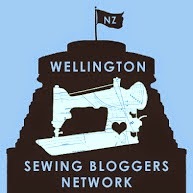 Did any of my friends sew or did I know of any people who would like it? Did I? For sure I did! 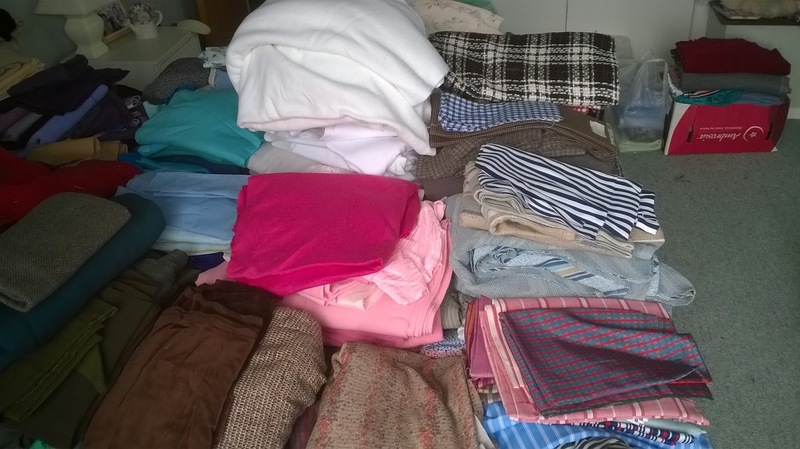 Why the lovely ladies from WSBN would be delighted to help out I was sure! As I was looking through the fabric I saw pieces that I was sure would be loved by others. I got in contact and posted some photos - and yes a fair proportion of the fabric was lovingly taken. This was given to us. Mrs L just wanted it to go to people who would appreciate it. 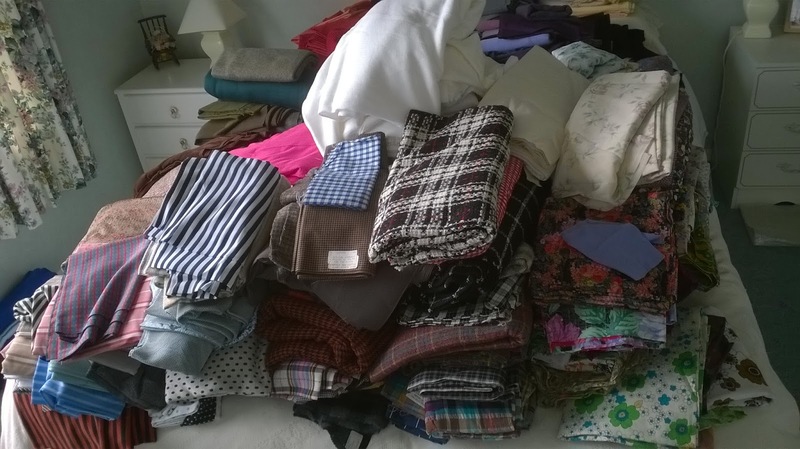 The rest was donated by Mrs L to the local Mary Potter Hospice shop in Newlands. And me? Well, I thought I showed pretty good restraint as what you see above was what I restricted myself to! At the moment it is still waiting to be used. But that is the wonderful thing about fabric and stashes isn't it? They just wait ever so patiently till the day you exclaim, "That is just the piece of fabric I need!" It's so true - fabric doesn't really have a use by date does it! You are so right MrsC! No use by date especially if it is not washed. Some of the pieces had labels and I'm sure I belonged to the same fabric place. For a fee they sent you a large bag of end of run/leftover stuff and you took what you wanted and sent back what you didn't. It was years ago though so I may not be remembering correctly!